The Plantagenet kings helped shape England from a colony to a structured monarchy and super-power during the middle ages. But like all great things, the Plantagenet era was coming to an end during the fifteenth century. Tensions were already high in England especially during the reign of Henry VI who suffered doubts of madness. Richard Duke of York was appointed protector of the realm but within a short amount of time, the famous War of the Roses was in full swing. In this novel we meet the spirited woman who would be the mother of two notorious kings: Cecylee de Neville. When young Cecylee marries Richard Duke of York she has no idea what her future will hold, but this strong woman holds her own in a world where the enemy is everywhere…lurking behind curtains, plotting against you….waiting to destroy you. The novel beings when “Proud Cis” is only nine years old and finds herself engaged to Richard. She does not want to be married to anyone, especially Richard but she has no choice, her father has made the match and she will follow his orders, he even goes so far as to lock her up when she refuses to marry him. This match is a very advantageous and lucrative one for the de Neville family, Richard is close to the throne and that could mean much in the years to come. Finally Cecylee accepts Richard and the marriage takes place. Richard wasted no time securing an heir by Cecylee….three children in four years left her feeling tired but she settled into life as a Duchess with ease. One day while Richard is away, Cecylee entertains a group of visitors and there is one visitor in-particular that catches her eye: the mysterious Blaybourne. Throwing caution to the wind, Cecylee and Blaybourne engage in a torrid affair that only lasts a short time. Blaybourne asks her to runaway with him, but when she sees Richard return, she knows she cannot. Shortly after Cecylee discovers she is pregnant and tells Richard the baby she is carrying is not his. Though Richard is devastated, he claims the child as his son…this son will eventually become king of England, Edward IV. Cecylee and Richard continue their lives and baby making with renewed fervor but a storm is brewing…..soon will come the War of the Roses, and with that war comes the ending of an era….Cecylee’s last son, Richard III was the last legitimate Plantagenet king. Thwarted Queen takes us thru a thrilling period in English history. Clearly Haggard has done an epic amount of research on this subject and time period….I was very impressed by her knowledge of the period and her ability to take lots of information and present it in an understandable fashion. Well done, this is not an easy period in history to dissect. That said, there were times that I felt like the novel read a little too much like a scholarly paper. All of the information was important and relevant to the story but I thought it could have been incorporated a little bit better than how it was. I felt like part three (Gilded Cage) was the slowest in the entire novel. Just when things started picking up at the end of part two, it ended and launched right into this lengthy historic background, I really had to push myself to read through the third part so I could get back to the thick of the story. For me, it lost momentum. That was the only reason I couldn’t rate the book higher….it lost too much momentum for me in the third part. My other issue with the book was the cover, I don’t think it’s capturing the essence of this novel. I am not quite sure what to suggest on this but it feels ‘off’ for me….when I look at the cover it doesn’t inspire any kind of emotion or interest in the story. But like a good reader, I try not to judge a book by it’s cover, but let’s be honest we live in a superficial society and people judge the cover. I thought it could have been better. If I saw it in the store I would likely pass the book up, and that would be sad because this was an enjoyable read that it worth a read! All criticism aside, I did really enjoy reading history thru a woman’s eyes, especially thru a woman such as Cecylee. 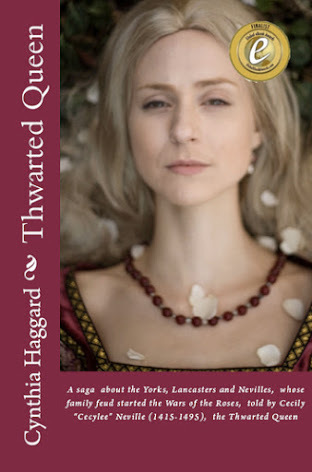 I didn’t know much about her (except that she was Richard III’s mother), before reading this novel, and even though this is a historic FICTION novel, there was a lot of historic facts about her that held my interest. The reader can’t help by sympathize with and admire Cecylee, she is strong and unyielding but yet she is a romantic at heart. The relationships between Cecylee and her children, as well as many of the other characters in the book were complex and intriguing, watching these relationships develop and play out were what kept me reading. If you can get past the history lesson midway thru, this novel picks up and delights readers. It is such a thrilling period in history. When I started reading the book the story of the discovery of Richard III’s remains in Leicester just made the news….so that really spurred on my interest in the novel itself. I love this period in English history (I wanted to do my MA in Medieval History if that tells you anything), and I know often in historic fiction it’s the Tudor period that shines….it was thrilling for me to read a book on the Plantagenet era instead. This book will delight fans of the era and hopefully inspire a few new fans!